If you have read any of my devotionals, or are familiar with my blog, or know me at all, you have figured out that I use this verse a lot. Why? Because I have discovered, the hard way, that it is very important to keep our focus on Jesus, or as Isaiah says in Isaiah 50:&, to “set your face like flint”. Think about it this way. 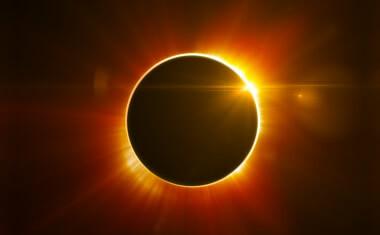 The sun, which is huge, can be totally eclipsed by the moon which is about four hundred times smaller. How is that possible? The moon gets between the earth and the sun blocking out the light. In the same way we can allow “things” to get between us and the Son, Jesus. Sometimes it is a person, our problems, our anger, our disappointment, even our success and accomplishments. Other times we end up giving more attention to our surroundings, the devil, or our own selfish desires. No matter what keeps our attention, if it isn’t God, we can eclipse His glory. A total eclipse pretty much caused darkness, a partial eclipse may still give us a small glimpse, maybe a little light around the edges, but God never intended us to live either way. His plans for us are uncountable, His thoughts for us limitless, as many as the sand (in the desserts, in the lakes and rivers, and even under the oceans). We can’t fulfill His purpose for us if we can’t keep our focus. A runner has to keep the finish line in his sight, a scientist has to constantly think about that cure, a writer works toward the end of the story, all of these things take focus. In reality, His Glory should eclipse everything else. His love should overwhelm us! His light should cause every other distraction to fade away, including our problems. His promises greatly outnumber our afflictions! If you need a little encouragement, listen to the song “He Is Jealous For Me” by David Crowder Band. Here is just a small sample “all of a sudden I am unaware of these afflictions eclipsed by Glory”. So, what are you allowing to eclipse Him? Or have you chosen to allow Him to eclipse all else?